Waking up at 5:30am in the morning, we found people already setting up on our little point of sand where we fished a couple of hours ago. We quickly got out of bed and stake out some real estate and sent the bait out. We fished with real intent the whole morning, but we only had crabs messing with our baits. Just before we pack it up at 9am, I had a good rip that made the reel sounded like a power drill going off. Unfortunately, the fish dropped the bait and left my reel with a pretty good birdnest to pick through. By 9:30am, we had to pack it in to be on our way further south. We made a stop at around 12:30pm to fish a residential canal for African Jewelfish. They were supposed to be around in the shallows near weeds. Perhaps the colder winter water sent them to other areas of the canal. We didn't see any or had any bites fishing blindly. We left that spot for the Tamiami Canal at around 3pm. It was really tight on time as we would have less than 30 minutes to fish before sunset. In hindsight, it was a blessing. Martini, a very accomplished fishing record holder, gave us the intel on this spot. He had caught a few Oscars and Walking Catfish in the past and that information was certainly solid. On our first casts, we were hooking Oscars on demand! 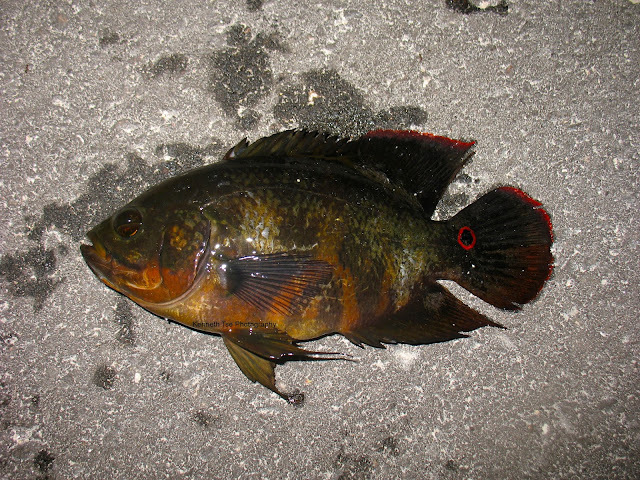 We did not see one Oscar last year while fishing the Tamiami. It may have been the extremely cold weather last winter that send them hiding. This year, we found them all over the canal. A simple split shot rig with a piece of nightcrawler was all it took to catch some. That picture didn't really do the fish any justice. There will be more beautiful Oscar pictures later on the trip. 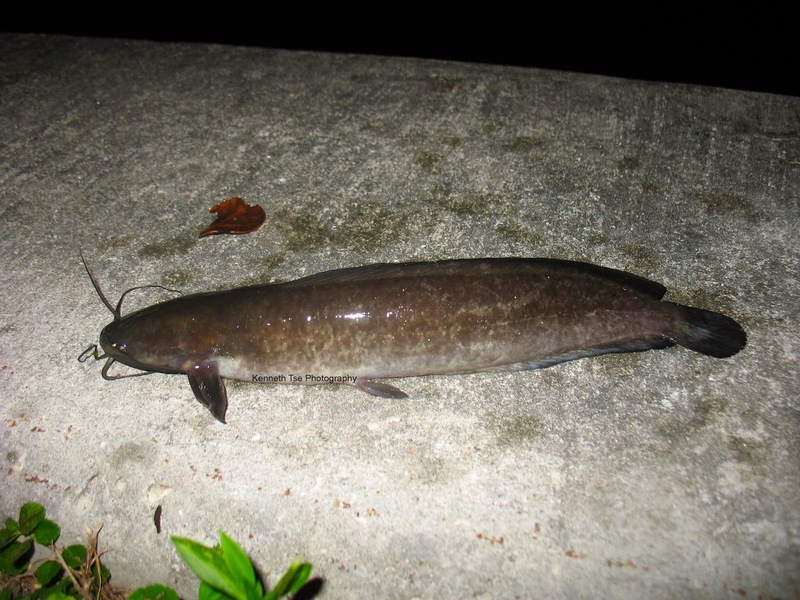 It was a blessing to fish at this spot after sundown because the Walking Catfish came out to play. We later learned that these catfish hide during the day and it would be very difficult catching them in the day. At night, they littered the bottom of the canal! They were very shy of bright light and will scatter away from the light. We found them with the spotlight, switched the light off, and then placed the bait in the area while the fish returned to locate the bait. We realized we needed to give the fish a little time to take the bait into their mouth...but they were not difficult to catch at all. It was a pretty long night of fishing and almost an entire day of futility. We felt pretty good ending the day with 2 new species before leaving for Coral Springs.